Any excuse for us to head to Dallas, we’re all over (hello Pecan Lodge!) The Dallas Art Fair will return to the Fashion Industry Gallery (f.i.g.) to kick off the fair’s tenth edition on April 12 through April 15, with its signature Collector Preview and Benefit on April 12th. The list of exhibitors includes nearly 100 galleries from 30 different cities. Several new additions including James Cohan Gallery (New York), Van Doren Waxter (New York), Casey Kaplan (New York), Paul Kasmin Gallery (New York), Rachel Uffner Gallery (New York), Green Art Gallery (Dubai), The Hole (New York), among others. The galleries join nearly 100 participants, from close to 30 different cities. Proceeds from ticket sales to the Dallas Art Fair’s Annual Preview Benefit will be donated to the Dallas Museum of Art, the Dallas Contemporary and the Nasher Sculpture Center. 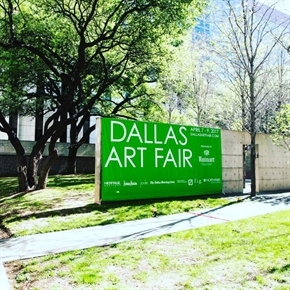 Fair week will also bring the third iteration of the Dallas Art Fair Foundation Acquisition Program in collaboration with the Dallas Museum of Art, with funding growing from last year’s $100,000 to $150,000. Led by museum Director Agusti´n Arteaga and Curator Katherine Brodbeck, donors will select works directly from participating galleries to be purchased for the Dallas Museum of Art’s permanent collection. See the exhibitor list below. The Dallas Art Fair is on view at Fashion Industry Gallery, 1807 Ross AvenueDallas, Texas, April 13–15, 2018. You can purchase tickets here.